Denver teachers wait for day two of bargaining talks between the union and school district to begin. 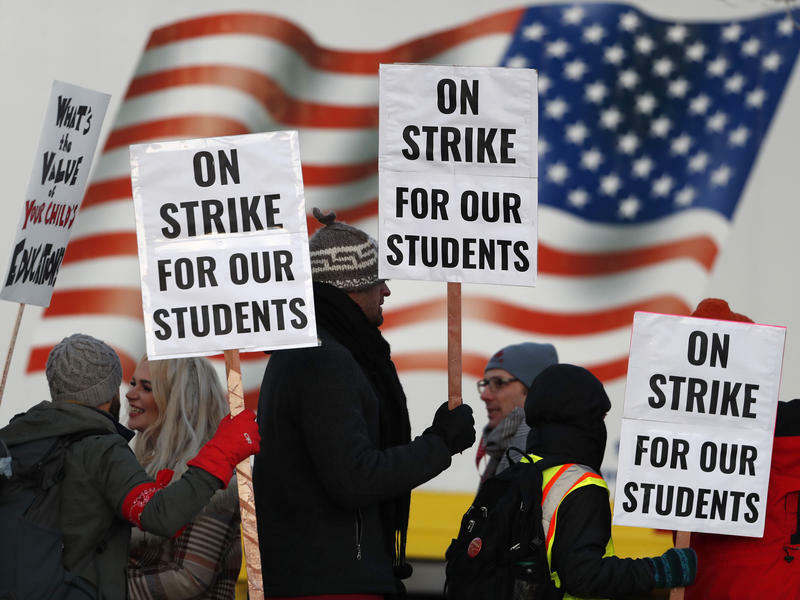 Denver school administrators and teachers are making progress as they try to end a three-day strike but still must address a major hurdle regarding educators' pay. The bargaining team representing teachers agreed Wednesday afternoon with much of the school district's proposal regarding how teachers can increase their pay based on experience, education and training over time. There is still no agreement yet on a top district priority: Bonuses for teachers in high-poverty schools and other schools the district prioritizes. Teachers want lower bonuses to free up money for better overall salaries. Teachers said retention data from those schools shows that bonuses alone will not help keep educators there. They suggested smaller class sizes, improved leadership and a focus on student services will have a larger impact. Denver teachers are on strike for a third day but teachers and school officials say they are hopeful they can reach a deal to end the walkout. Negotiations resumed Wednesday morning following talks that lasted into the night on Tuesday. Union president Henry Roman and superintendent Susana Cordova said in a statement the exchanged proposals have moved both sides closer together. Teachers are striking to raise their pay and reduce their reliance on earning bonus pay. One of the main sticking points is the size of bonuses for teachers in high-poverty schools and other schools the district prioritizes. Denver teachers are set to extend their strike into a third day after negotiations with district leaders ended Tuesday night without a deal. Tuesday's talks came a day after more than half of the city's teachers walked off the job amid a pay dispute. The negotiations, which are set to resume Wednesday, began with discussions over changing Denver's pay system to more closely resemble those in other districts that make it easier for teachers to advance in pay based on experience, education and training. On Tuesday, all schools remained open and staffed by administrators, substitutes and teachers not participating in the strike. At the start of the talks, superintendent Susana Cordova acknowledged that students were not getting the kind of instruction they normally would and said she was committed to reaching a deal to end the strike. Denver teachers and district leaders are continuing negotiatons to try end a strike over pay with the help of a federal mediator. "I wish we weren’t here. I miss my kids. I run two special ed programs at my school," said middle school psychologist Benjamin Marcial during a caucus break. Tuesday's talks come a day after over half of the city's teachers walked off the job. The negotiations began with discussions over changing Denver's pay system to more closely resemble those in other districts which more easily allow teachers to advance in pay based on experience, education and training. Both sides alternated meeting publicly and then taking time to discuss proposals in private. Denver teachers rallied at the state Capitol at 2 p.m. after going on strike over failed pay negotiations. The Denver Public Schools district has proposed raising starting teacher pay from $43,255 to $45,500 a year. That's $300 a year less than the union's proposal, which would add $50 million a year to teacher base pay, according to union officials.